Jackie Home Entertainment Review: An appreciation of a new American classic | SWITCH. Appearing in Australian cinemas just as the recent nail-biting Oscars race was coming to an end, Pablo Larraín’s remarkable biopic of Jackie Kennedy, featuring a towering central performance from Natalie Portman, left critics ecstatic and audiences divided. For some, it was a sublime and uncompromising vision from a great director, approaching the tired format of the biopic with unexpected flair and ingenuity. For others, it was ridiculous, wrought and a bit boring, not really offering any quotable facts about Jackie or a solid overview of her life. I’m not going to lie, I was very much in the former camp - on my first viewing, ‘Jackie’ left me reeling and breathless, and I regarded it far superior than most of the films garnering acclaim at the time. Now that the film is receiving a Blu-ray and Digital HD release, here's my argument for why ‘Jackie’ should be counted as a new American classic as much as ‘La La Land’ and ‘Moonlight’. Focusing on the week following JFK's assassination in November 1963, we see Jackie (Portman) content with the demands of being the now widowed First Lady, the transition from one presidency to another, the needs for the burial of a head of state and the dangers of further attacks that could occur around any corner, all on top of needing to care for her children and grieve her husband. Very quickly, both Larraín’s direction and Noah Oppenheimer’s superb screenplay lay out the enormous emotional canvas the film has to contend with, and as we move from the framing device of Jackie being interviewed by a reporter (Billy Crudup) after the fact and the week itself, the emotional stakes continue to build. Larraín isn’t interested in reality though, even with his use of 16mm film and mixing archival footage with the film itself. This is a supposition, an imagining of an experience its protagonist states early in the film that we can never be a part of. Gloriously shot by Stéphane Fontaine, the camera enquires and observes, taking in the lonely figure of a widow against the backdrop of American power. Jackie herself is responsible for constructing the Camelot myth around her husband and his presidency, and we the audience are given front-row seats to watch it happen. There is an almost stream-of-consciousness, dreamlike quality to ‘Jackie’, more a meditation on an historical moment than a reenactment. Larraín’s approach is bold, baroque and gothic, opulent but always with a seething unrest as the idealised dreamworld of the White House collides head-first with the unsettling realities of mortality. Nothing about ‘Jackie’ is as you expect it to be, from its structure to its texture to its tone. While it’s almost impossible to single out any one element in a film whose vision is so holistic, Mica Levi’s Oscar-nominated score solidifies the unusual, gothic nature of the film, one that refuses to comply with the emotional manipulation we’re so used to in biopics yet is deeply human, the sound of a human soul shattering and recreating itself under enormous pressure. Central to all this, holding Larraín’s intoxicating symphony together, is Portman’s enormous, magnificent performance. Jackie Kennedy is an pop culture icon, one who rarely offered the public a view behind her perfectly poised veneer, and what makes Portman’s performance such a triumph is that she understands this implicitly. The veneer is an integral part of Jackie, her armour and her superpower, and so carefully are the moments chosen where she allows that armour to fall away. Portman’s commitment to this is total, resulting in a performance that at one moment borders on camp before shifting with lighting speed to raw and human and devastating. It’s easily the finest performance of her career to date, and one that arguably should have won her a second Oscar. The rest of the cast hold together beautifully, especially Greta Gerwig and John Hurt (in one of his final performances), though Peter Sarsgaard might be the only misstep in an almost perfect film with his performance as Robert Kennedy. There’s no question that Pablo Larraín’s ‘Jackie’ is a enormously melodramatic film, but by virtue of the fact it is so acutely aware of this fact, I’d argue that this is a strength as opposed to a weakness. By refusing to comply with the expected tropes of the biopic, it feels unlike anything we've seen in American cinema in a long time. I think ‘Jackie’ is an extraordinary film, very probably a masterpiece, a beguiling and hypnotic dream that I keep finding myself returning to. It somehow manages to tell an intimately human story against the backdrop of the American Dream and a moment where it came crashing down. It is easily one of the best films we’ve seen on Australian screens this year, and I’d even go as far to call it one of the finest American films of the decade. Larraín’s approach is bold, baroque and gothic, opulent but always with a seething unrest as the idealised dreamworld of the White House collides head-first with the unsettling realities of mortality. On Blu-ray (available 19th April), all the extras from the U.S. release appear to have been carried over. This includes ‘From Jackie to Camelot’ (22:25), a general overview of the production, an image gallery and the theatrical trailer. Unfortunately, technical details about the disc were unavailable. The Digital HD release (available now) also reflects the U.S. release by also including an audio commentary from Larraín and Portman. While access to the digital copy was included with the U.S. Blu-Ray release, the same doesn’t happen here, meaning that anyone wanting to access the commentary as well as own the Blu-ray have to buy both versions. The fact the commentary wasn’t included on the disc or a digital copy included with the Blu-ray is very disappointing. The 'Jackie' competition has now closed. Winners will be announced shortly. Competition opens at 5pm AEST on Sunday 16th April 2017 and closes at 11:59pm AEST on Sunday 23rd April 2017. Five winners will be chosen at random on Monday 24th April 2017. To successfully win, entrants must fulfil the above entry conditions before the time the competition closes. Current members/followers are eligible to enter the competition. Only one entry per person. Only one winner per household. To be a valid winner, the entrant must not have won a prize from SWITCH within the last 28 days. Each winner will receive one Blu-ray copy of 'Jackie'. By entering, you agree to receive occasional emails from SWITCH in the future. If you decide to unsubscribe from these updates, any further entries will not be applicable. Only Australian residents are eligible to enter. 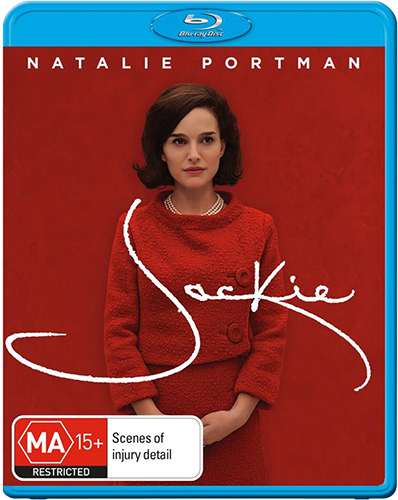 'Jackie' is available on Blu-ray, Digital HD and DVD on Wednesday the 19th April 2017 from eOne. Inarguably, Portman is Jackie O. This performance is career-defining, and sorely absent from the Oscars nominations. The rest of the film occasionally deviates from brilliance, but is extraordinarily effective at maintaining the tension and emotion for the duration of the film.